It’s time again to highlight another great venue in the Charlotte area! Here at Magnificent Moments Weddings, we love nothing more than sharing these great venues and the people who work at these locations with you, our clients. This week’s spotlight is on The Mint Museum Uptown and the many features it has to offer! The Mint Museum Uptown houses the internationally-renowned Mint Museum of Craft + Design, as well as outstanding collections of American, contemporary, and European art. 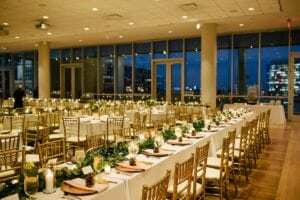 Located in the heart of Charlotte’s uptown, the Mint Museum Uptown also serves as a stunning wedding venue for Charlotte brides. Plus, its central location makes it close to five-star hotels for your guests, stunning city backdrops for amazing bridal party pictures, and party-worthy bars to continue the fun after the wedding reception ends. Sound pretty amazing? We haven’t even mentioned the amazing event staff of The Mint Museum Uptown who settle for nothing less than perfection. We love the staff so much, we thought it would be great to introduce them to you! So we sat down with Tom Martin, Director of Special Events, who gave us all the details on this great location. We do about 50 weddings per year at our Uptown location. Many different types of unique décor work due to the contemporary and natural architecture of our rooms. Ceiling and wall drapings, crystal chandaliers, multiple lighting application, and suspended floral pieces. For food, some of the fun items have been suspended wedding cakes, (end of reception snacks) King of Pops cart, New York style hot dog cart, and Duck Donuts are just a few of the last impression goodies that I’ve seen that guests love! Our most favorite part of working in the wedding industry is being able to meet with our clients, and capture the vision they have for composing the wedding day of their dreams. The highest level of satisfaction is derived when our clients, wedding planners, and professional vendors collaborate to build what becomes a true performance. Hire a well established planner! 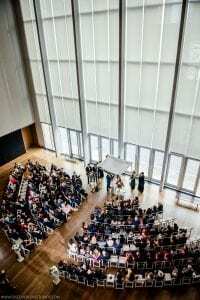 Amanda is on our short preferred planner list, and has been an integral part of numerous successful, and memorable weddings here at the Mint Museum Uptown. Key industry insight, general knowledge regarding all of the vendors in their products and pricing, a high level of experience in logistics and pre-planning, are just a few of the services you will need for your wedding. Following each successful wedding, and the accolades that we receive from our clients, I immediately defer to the planner, as they are the “general contractors” for your special day. Whether you hire a planner for several days or months, or just the day of, these are the professionals that will protect the tremendous investment that you’ve made both financially, and in each other!